One of the most frustrating aspects of drawing with pen and ink is the accidental smear that results from not allowing ample time for the ink to dry. A smear can result from an object coming into contact or sliding across a wet part of a freshly drawn line. 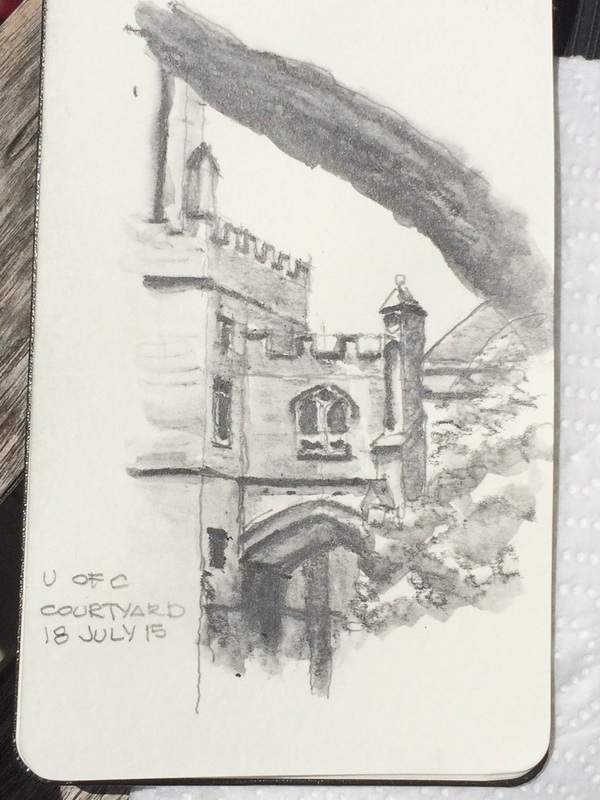 I like to pencil in my sketch lightly and then trace over it with pen and ink. Of course, I am a little bit of a neat-freak and cannot wait to erase the grey lines of the pencil--sometimes a little too soon after inking the line--and create a smeared line. Other times I have inadvertently rubbed the heel of my hand across a wet line when I am working swiftly back and forth across the drawing and created a mess. Thankfully there is no need to slow down the speed at which the sketch is drawn because there are a few tricks to keeping this from happening. 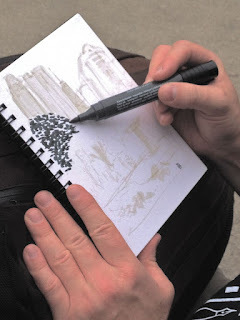 one end against an unused portion of the drawing surface and the other end is supported by the left hand at a slight angle away from the artwork that allows for the drawing hand to comfortably reach the drawing surface with a pen. The drawing hand is placed midway up the baton and moves freely about the length of the baton. Other similar sticks that create the same kind of brace for the drawing hand include a dowel rod with a tennis ball fitted over the ends; or a walking cane with a rubber footing at one end. All of these methods help keep the drawing hand safely away from the drawing surface and especially the wet inked lines. what is known as a "Drawing Bridge." A Drawing Bridge is a rigid flat stick, such as an old ruler or paint stirring stick, with a wooden block at each end so that it looks much like a bridge. These are easily crafted out of objects commonly found in the home or at the local hardware store at relatively low cost. The nice thing about this method is that there is already a straight edge built in which allows for easy drawing of precision lines. A third method I have often used involves laying down a larger circle template and then placing the desired size template or ruler over the drawing. This permits separation from the drawing tools and the drawing surface to avoid any possibility of contacting the ink. Finally, there are a few other ideas to protect the drawing surface from the hand and tools used by animators, sign painters, and airbrush artists. They will often get a pair of cotton gloves from the science surplus store, cut off the thumb and first two fingers of the drawing hand glove. This gives a sense of touch to the fingers that hold the drawing tool and protects the heel of the hand from contacting the wet inked lines. If all else fails and cotton gloves are not readily available, then the use of a forearm or a balled up t-shirt also make great supports for the drawing hand when placed just under the right-handed forearm. As part of the Chicago Artist Month in Chicago, Urban Sketchers Chicago has teamed up with Lewis Achenbach and the Vincent Davis Trio to participate in a first ever Live Music Sketch Crawl, an event called "Jazz Occurrence #6". What we are trying to do is to fill up the room with Urban Sketchers and artists to come and sketch, draw, or paint while live jazz musicians from the Vincent Davis Percussion Plus perform just for us. 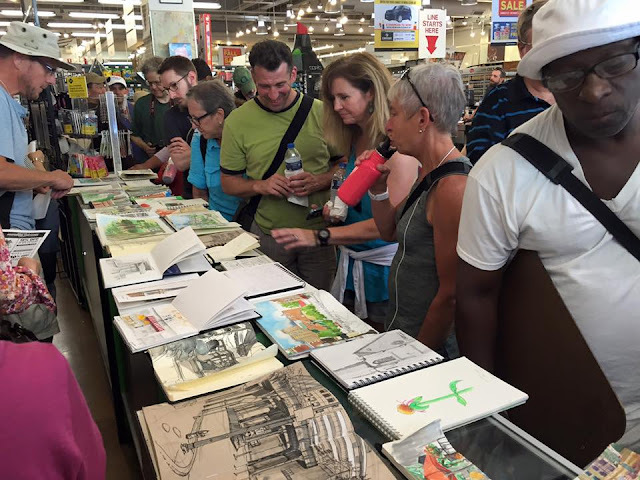 It will be unlike any sketch crawl we have ever had and we hope you can attend. The tickets are super inexpensive (just $10) for such an event and it will help pay for the amazing musicians and the venue. Tickets are available now. Then be sure to bring your art supplies. A Jazz Occurrence is defined as a union of the Sonic Arts and the Visual Arts. A JAZZO is a performance in a creative environment of something close to complete freedom, forming, essentially, a third hybrid exponential enlightening art-form. The idea is to capture the ‘frequency in the room’ on canvas. This project supports the notion that creative music is vital and progressively positive and therapeutic. The Jazz Occurrence is also a documentary in progress, combining concert footage, painting performance, audience reaction, musician interviews and animations. Lewis Achenbach is the founding artist and 'phantom keystone' of the project. An elementary education CPS Jazz Occurrence is also in the works for CAM. Where kids for K-5 will 'paint to the music' both recorded and live. These artworks will be part of the JOAE. The JOAE (Jazz Occurrence Art Exhibition) is a traveling show; a caravan of artistic experimentation. For CAM, the exhibiton JOAE3 is currently seeking a exhibition space for the increduble artworks yet to be produced, mid November (email me at lewisachenbach@yahoo.com). Oct 10th JazzOccurrence Six at Constellation Chicago (3111 N Western Ave) with the Vincent Davis Percussion Plus, Lewis Achenbach and the Urban Sketchers. VDPP is Darius Savage, Preyas Roy, Scott Hesse, Andrew Lawrence and Vincent Davis, featuring Hanah Jon Taylor on sax. Oct 24th Jazz Occurrence Seven with Volcano Radar hosted by High Concept Labs. Special guest artists, Daniel Zalkus. VR is Julia Miller, Elbio Barilari, Lou Ciccotelli, and Harrison Bankhead. $10 or free with student ID. In case some of you missed the story behind this sketch, this great old 1958 Triumph TR3 was sitting across from Clark's on Clark Street in Evanston. Thank you Lee Solock for pointing it out to me smile emoticon. I met the owner of the car, a woman named Amanda, when I was about halfway done with the sketch and she and her friend came out of Clark's. As they loaded into the car, I thanked her for letting me sketch her car. Surprised, she asked to see the sketch (which was only halfway done at the time) and she told me that this car has always been in the family and it was most recently her late father Chuck's. In her words "I'd really rather have my dad, but at least I get to drive his car around." He also loved to eat so now she honors her dad by driving this car out to eat someplace. I told her that now I was honoring him by sketching his car. Actually leaving the scene required a can of starting ether from the glove box and undoing the hood latches. Isn't it nice when a lady knows her way around a vintage car like this? After I had finished this sketch, I scanned it and sent a copy to Amanda and she told me the rest of the story. It turns out that this little car was recently shipped in a U-Haul from Wisconsin (because a normal car carrier is too wide) and that I happened to capture this car on its maiden voyage since that trip. She said that the trip to Clark's was intentional and she had no idea that I would be there to artistically record this special day. 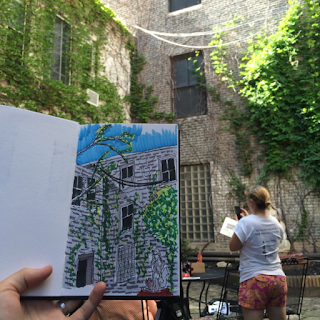 Each month, Urban Sketchers Chicago meets at a different location to sketch as a group. 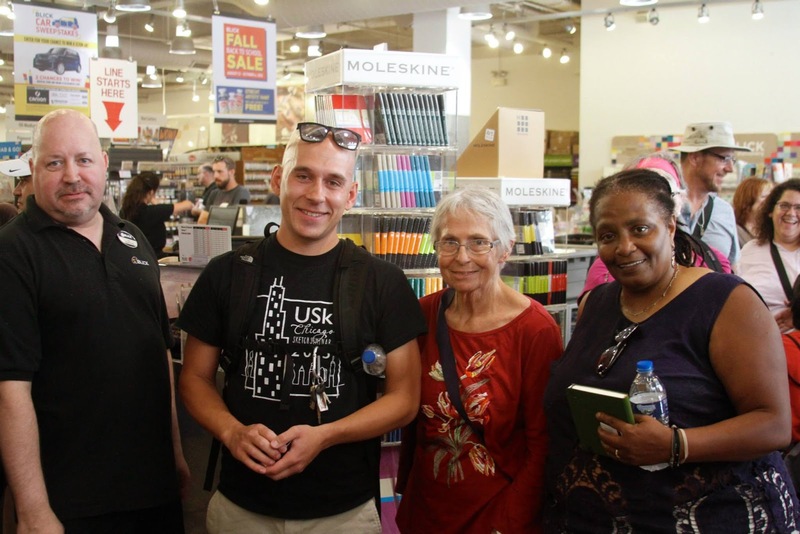 On Saturday August 15th, we had the unique opportunity to partner with Blick Art Materials in Evanston for this months event. Veterans to the group and many new comers alike gathered inside Blick for a brief introduction to Urban Sketching by Wes Douglas. We were thrilled to see so many new faces. Thank-you to Blick Art Materials for promoting the event and our group in their Evanston store location! Per usual, we dispersed throughout the local neighborhood to sketch for a few hours. 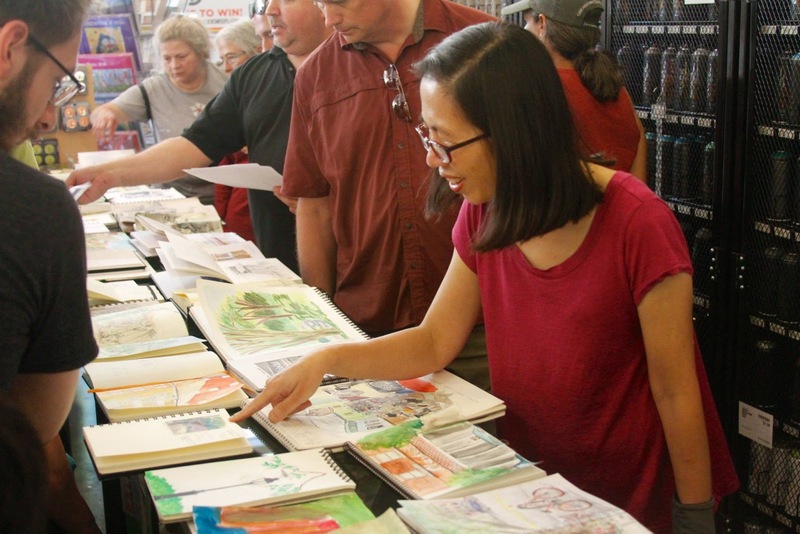 I have been participating with USk Chicago since 2013 and have never seen so many sketchbooks laid out together at a monthly event like this before. 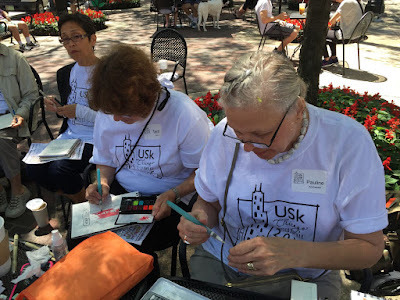 Since I began participating with USk Chicago and the Urban Sketchers movement, it has been fun to see our Chicago community grow to the 400+ member group we are today. Each month's event seems to attract a larger and larger group each time. 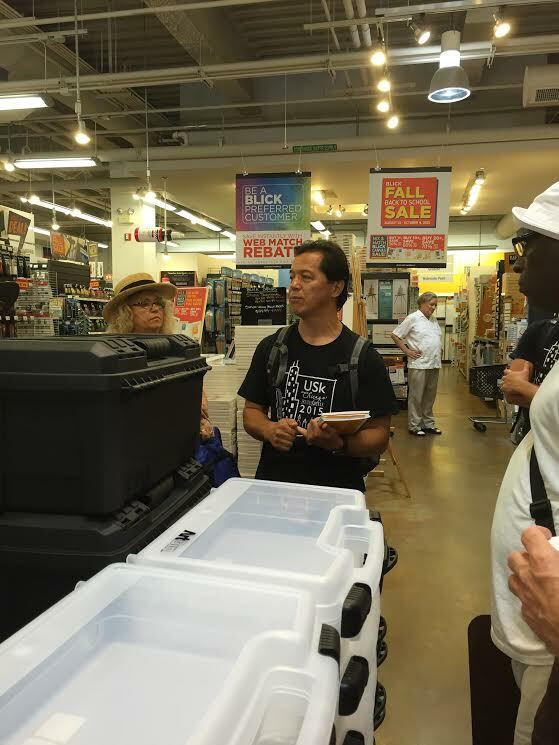 At the end of the day, Blick hosted a raffle drawing where three lucky winners recieved gift cards, each valuing $25, $50 and $100. 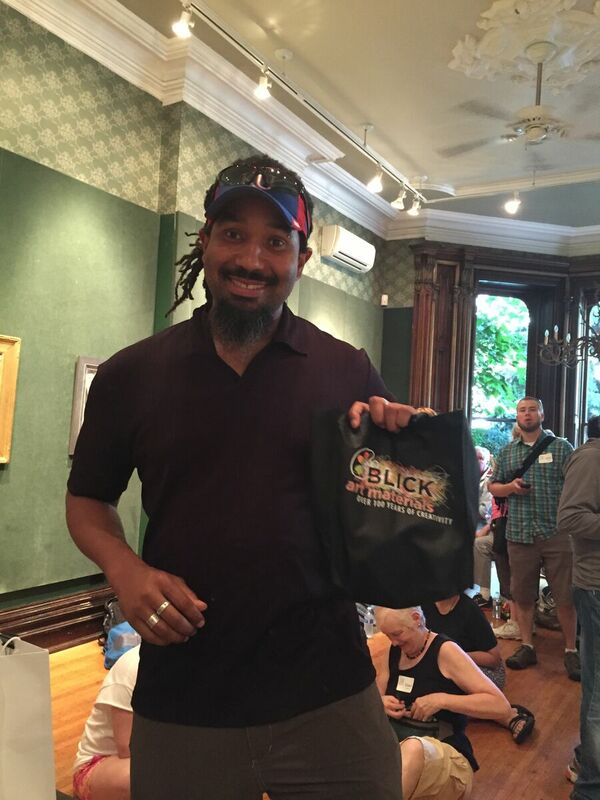 Thank-you to Blick for thier generosity and congratulations to the raffle winners! 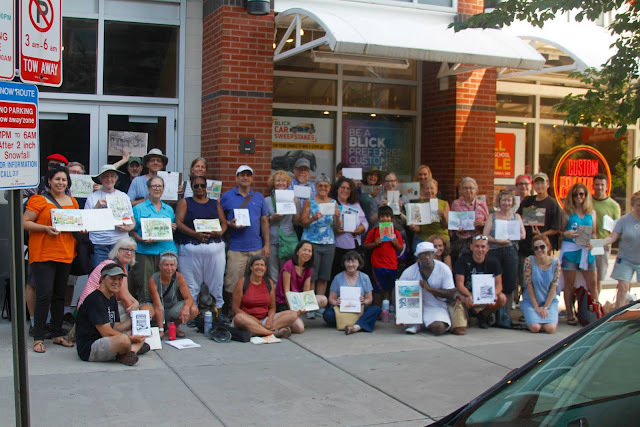 After sharing our sketches, many of us walked over to World of Beer for food, drinks and conversation. If you are interested in joining us at our next event in September, keep an eye out for an announcement which will be made on September 1st. 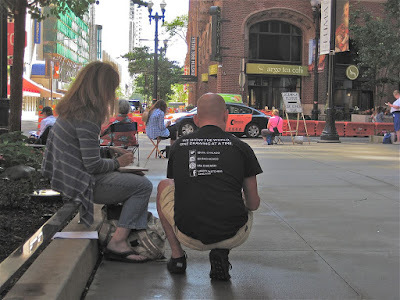 If you have any questions about Urban Sketching or our Chicago chapter, feel free to email us at urbansketcherschicago@gmail.com. If you live in the Chicago area and are interested in joining our group, find us on Facebook and request to join. Look forward to seeing everyone at September's event! 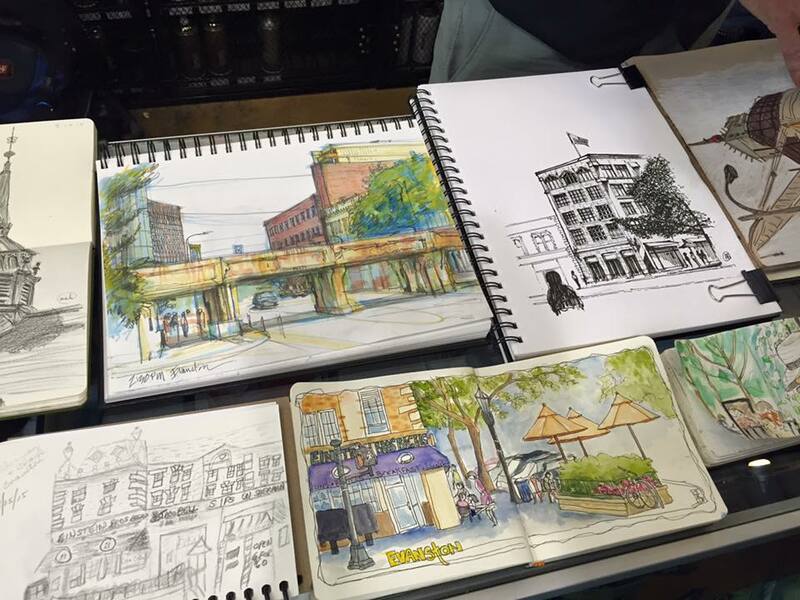 The 2015 Chicago Sketch Seminar would not have been the successful weekend it was without the support and generosity of our amazing sponsors. 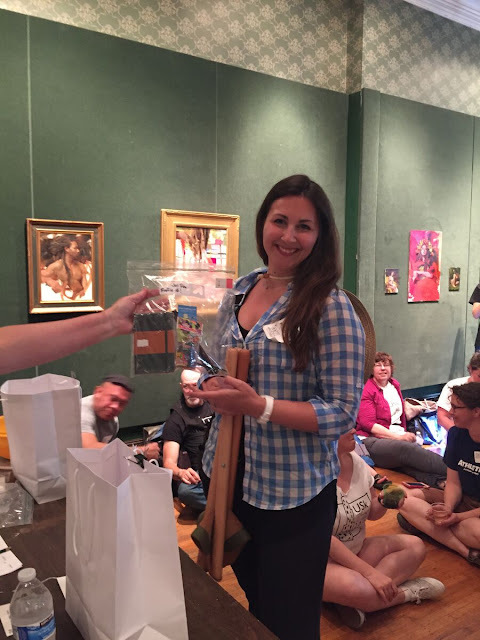 From a venue for the seminar's home base, to a wide variety of premier quality art supplies and raffle prizes, to delicious local food and drinks, our sponsors helped take our event to the next level. 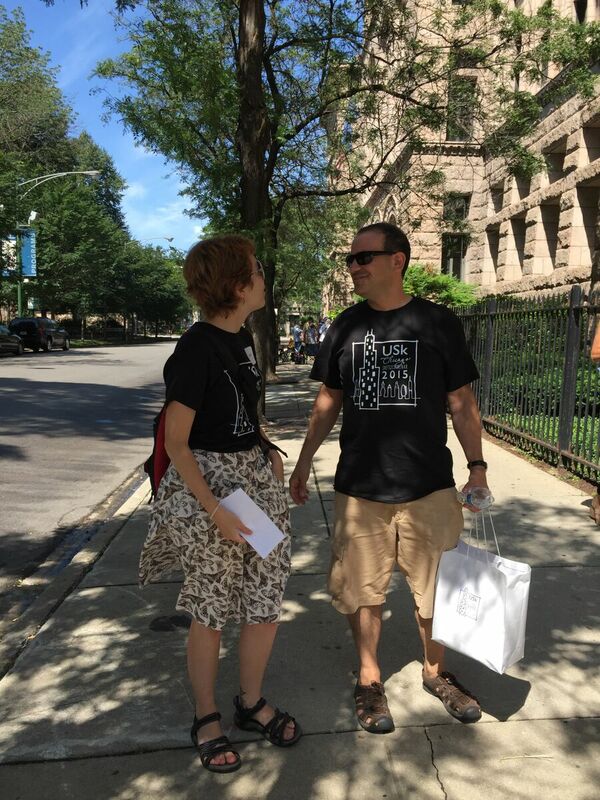 Opening its doors to us for the second year in a row, PALETTE AND CHISEL ACADEMY OF FINE ARTS provided the perfect, central, artist-friendly setting and home base for the weekend. HAHNEMUHLE – We were excited to introduce this German-based paper company to our Chicago community this year. 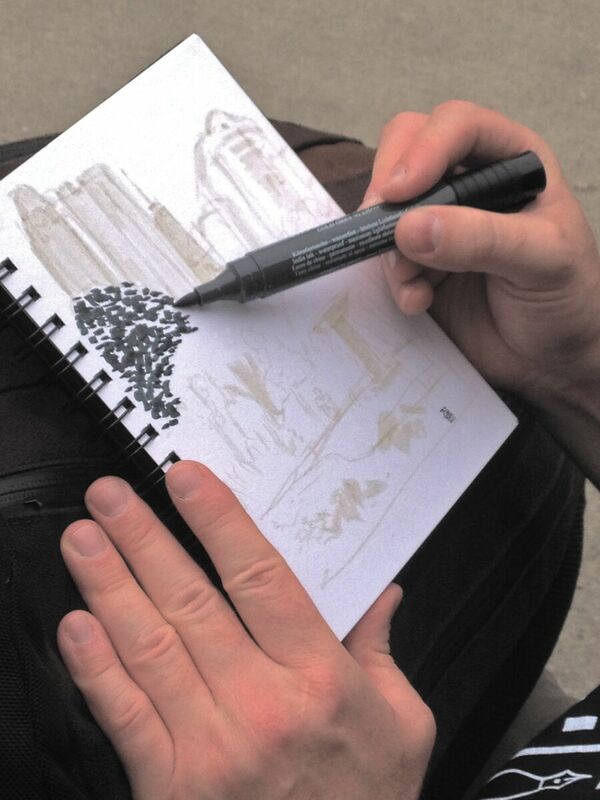 Hahnemuhle is renowned for its assortment of high quality art papers and provided each participant with a two pack of their Sketch & Note pocket sizes sketchbooks. 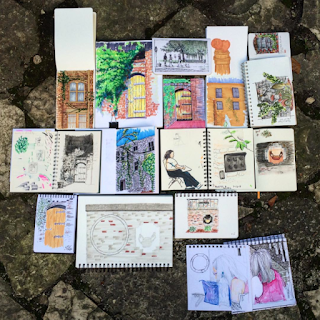 These conveniently sized sketchbooks are perfect for the urban sketching hobby and lifestyle as you can easily keep one with you throughout the day in your back pocket, purse or backpack. Perfect for quick note taking, sketchers recorded all of their newly learned skills in these great notebooks at the Seminar. 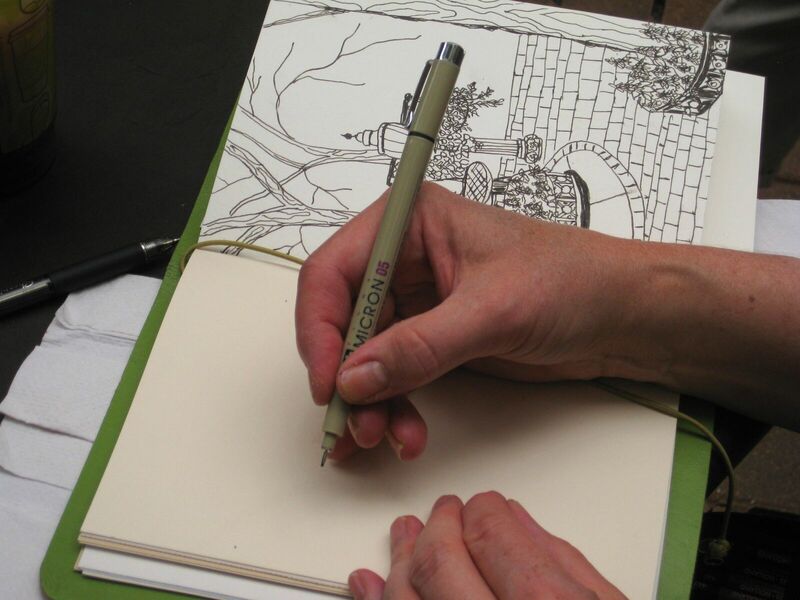 GENERAL PENCIL, a New Jersey based art and craft pencil company which proudly manufactures it's products here in the USA, provided ample sketching pencils in a variety of softness's as well as their really fun Sketch and Wash pencils. Thank-you for your generosity! As if the SWAG bags were not enough, many participants were lucky enough to win some of this year’s wonderful raffle prizes. DEATRAMENTIS, a German-based fountain pen ink manufacturer provided an entire set of beautiful inks. Susan Hanley created this sketch with the Violet ink she won. JET PENS provided enough supplies for two sets of prizes each including a variety of pens, pencils and different types of pocket sized sketchbooks. MONKEY PENCIL SCREEN PRINTING came through for a second year in a row printing our T-shirts. Thank-you to William McGhie for his great work on these. They turned out great! Last but not least, after a packed weekend of sketching, everyone was ready for some good food and the generous people at LETTUCE ENTERTAIN YOU and local favorite, the CAFE-BA-BA-REEBA restaurant, teamed up to provide us with a delicious snack of Spanish style tapas. Each person also walked away with a $25 gift card toward their next meal. On behalf of the entire USk Chicago community, we would like to extend a huge thank-you to our amazing sponsors who made the 2015 Sketch Seminar a huge success. We are honored to share your products with our community and look forward to collaborating with you again in the future! Do Your Seminar Notes Look Like These? Let's think about the typical seminar experience. Fancy hotel room, business attire, sign-ins with nametags, free coffee, Continental breakfast, and conversations with strangers. Let us not forget the tiny notepad, cheap ballpoint pen and a stack of copies from the day’s worth of presentations. 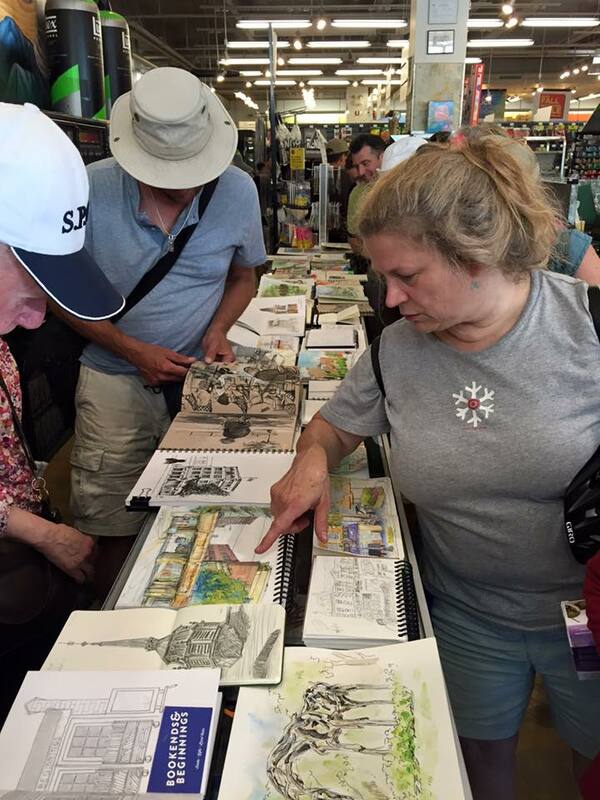 Now let's contrast this with an Urban Sketchers Chicago Sketch Seminar experience. You arrive at the Palette & Chisel, one of the oldest art schools in Chicago in a period architecture building on north Dearborn Avenue. 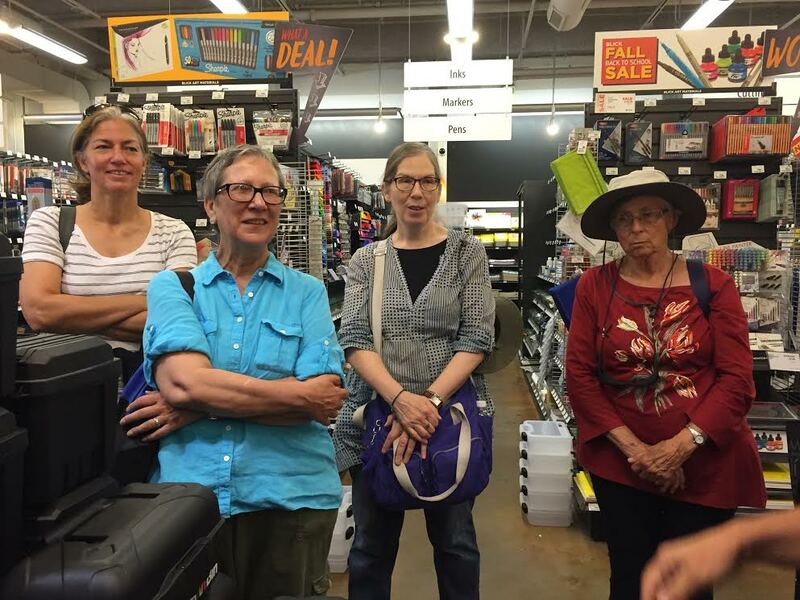 Instead of stocking up on supplies from OfficeMax, your backpack or shoulder bag is filled with supplies easily found at Blick Art Supplies. 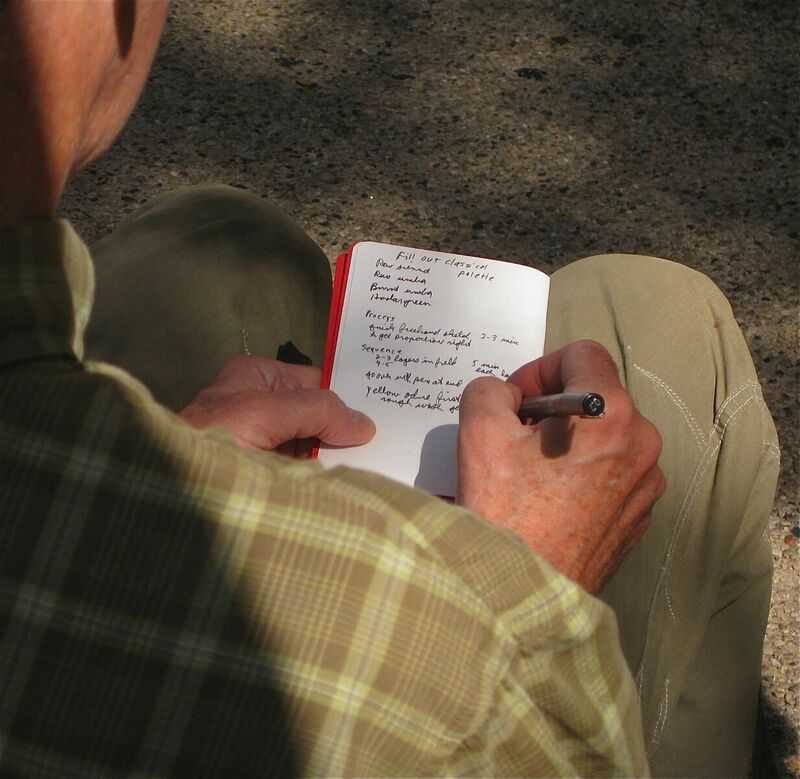 Nowhere are the skimpy hotel notepads and cheap ballpoint pens. Rather there is a goodie bag filled with exciting samples from Faber-Castell, Winsor & Newton, JetPens.com, Sakura Art Supplies, Nock Co. and Hahnemuhle--samples that are not only useful but premium quality samples...and coupons so that you can add to your collections. Workshops at this seminar are filled with instruction from experts in their field, discussions, shared stories, and hands-on participation. 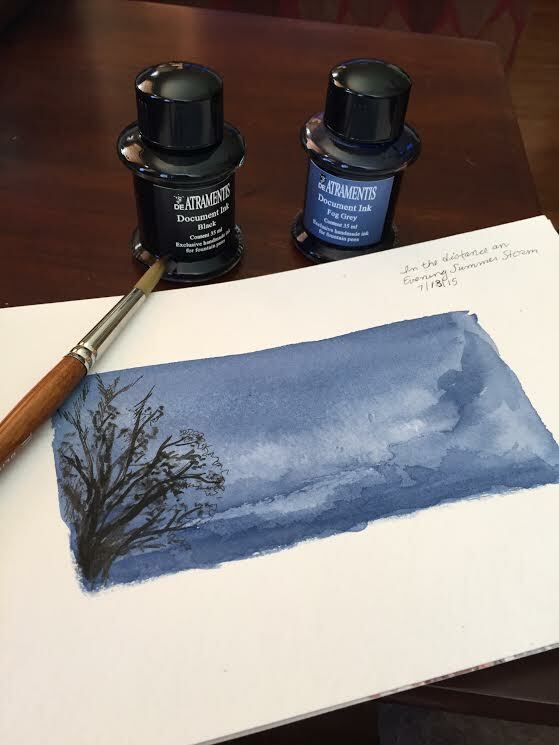 Sometimes there is experimentation with new supplies and other times the few supplies that you have amassed on your own are plenty useful with the techniques that are covered. Judging from the comments and reviews of participants, the top comments received as feedback were the personal attention of the instructors, the ability to practice the techniques that were demonstrated and the lively conversations with other like-minded artists in an otherwise solitary activity. 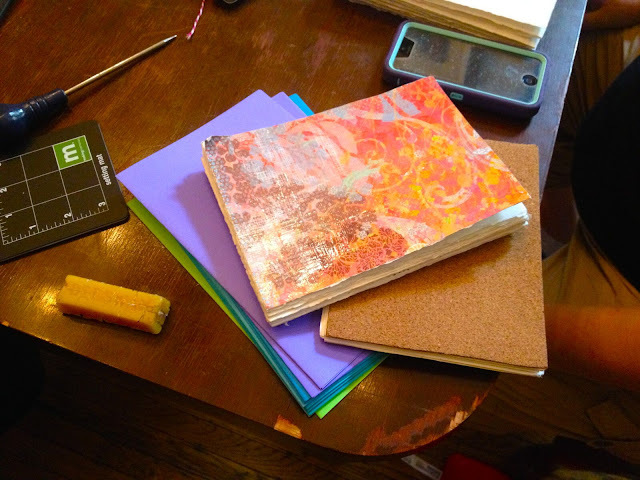 Many people expressed how inspired they were by seeing everyone's sketchbooks and to be able to talk about discoveries and accidents that resulted in interesting, cool effects. One of the more talked about products was the Winsor & Newton's newest product, the watercolor markers. The idea that markers could be colored onto a page and then blended with water brushes grabbed the attention and chatter amongst the Chicago Sketch Seminar participants.